A combination of these produce all the different colors. The application of red dye is called Ghan Rangai. For ghan grangai, the alum mordanted fabric is introduced into a heated water bath along with Alizarin. It produces the red, wherever the fabric is mordanted with Alum. The third primary shade, yellow is obtained using Nasphal Putai. Nasphal dye is a cold solution of anar ka chhilka ( pomegranate rind) and haldi ( turmeric) which is typically smeared ( Potai or putai) onto the cloth surface after all other dye and print process has been completed. As an overdye, nasphal generates a number of other shades: over indigo it creates green, over kasumal it gives orange, and over red dyed areas it results in softer red-ochre shades. This smearing is done quickly and after smearing, the cloth is laid in the sun "until it smells cooked". After that it is rinsed in Alum solution, dried and aged and washed thoroughly. In Sanganer and Jaipur Style of printing, red and black motifs are printed on a yellowish cream ground- This is called the Syahi Begar Style. In the printing paste Syahi ( Iron acetate) and Begar ( Alum) are the mordanting components. Traditionally Potash Alum is used which is a hydrated double sulphate of aluminium or potassium. These days aluminium sulphate is used. This is how Syahi paste is made - Scrap iron horseshoes are removed from rust by scorching, then mixed with Gur or sheera ( Unrefined molasses) and covered with plane water, during which the sugar ferments and reacts with iron to make iron acetate solution. To give deepar shades of red during dyeing, a little of syahi paste is sometimes blended to the begar mix. Interestingly proportions are tested and judged by taste- large amount of alum (producing deeper shades) are described as producing a 'crackle' on the tongue. Before Syahi and Begar is applied, the cloth is first desized using local methods ( Hari Sarna), then it is prepared for mordanting using Myrobalan (Harda or Peela Karna). Usually any areas where black is required are printed first, using syahi paste. Following this, where red is required will be filled in using the begar ( alum mordant) paste. 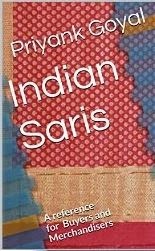 In Pipar/Sanganer/Balotra, apart from the above methods, they are also printed using indigo-dabu resist methods, which produces colored red and yellow motifs on blue, green and dark-browinsh backgrounds. The answer is yes, the color obtained from Alizarin after mordanting with Aluminium metal salts is also called Turkey Red. This is the red color popularly used in Dabu, Bagru, Tarapur, Kalamkari and Ajrak handblock prining of India. Alizarin is a mordant dye. Mordant is an additive which improves the ability of a dye to bond to the fabric. Mordant dyes are used in combination with salts of metal ions, typically aluminum, chromium, iron, and tin. The metal ions adhere to the fabric and serve as points of attachment for the dye molecules.So Aluminium present in Alum is used to generate that famous red color of alizarin. Other metal salts can be used as mordants for alizarin with some interesting color changes results. For example iron sulfate as the mordant imparts a rich brown color to the dyed fabric. Alizarin, also spelled Alizarine, a red dye originally obtained from the root of the common madder plant, Rubia tinctorum, in which it occurs combined with the sugars xylose and glucose. The cultivation of madder and the use of its ground root for dyeing by the complicated Turkey red process were known in ancient India, Persia, and Egypt; the use spread to Asia Minor about the 10th century and was introduced into Europe in the 13th. Laboratory methods of preparing alizarin from anthraquinone were discovered in 1868, and, upon commercial introduction of the synthetic dye in 1871, the natural product disappeared from the market for textile dyes. There is a difference in Turkey Red and Turkey Red Oil. Turkey red oil, also called sulphonated (or sulfated) castor oil, is made by adding sulfuric acid to vegetable oils, most notably castor oil.It was the first synthetic detergent after ordinary soap. It is used in formulating lubricants, softeners, and dyeing assistants. A trivia- Alizarin is something of a fungicide and pediculoside (that is why it found in the soldiers uniforms). Change 840 to appropriate systems for other fibers. (3 x 2.2 x 40 x 840)/(56 x 1.09)= 3633 ends.